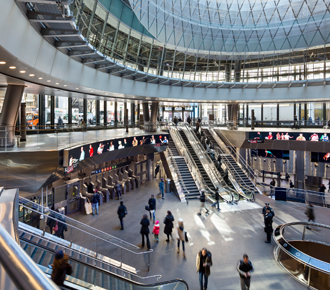 The multi-award-winning transit centre and retail complex, Fulton Centre, links six subway stations and 10 subway lines from the heart of lower Manhattan, New York City. Opened in 2014, it used by more than 300,000 commuters every day. Arup, the prime design consultant, was presented with the 2018 Dr. William W. Hay Award for Excellence from the American Railway Engineering and Maintenance-of-Way Association (AREMA) for its work as lead consultant on the project. The Hay Award, is one of the American rail industry’s most prestigious awards and honours projects that excel in the specific areas of innovation, safety, service performance and reliability. It is the 37th award the Fulton Centre has won. Not surprisingly, a guiding principle for the design, from the master planning stage onwards, was to simplify access to these platforms and ease the transfers between lines for passengers. The design team needed to understand how people would move through the station and resolve any potential conflicts before finalising plans for the US$1.4bn project. “With any transit project, there is a lot of competition for a limited amount of space,” says Eric Rivers, a pedestrian planner with Arup. Subway platforms, for instance, are used as corridors as well as for boarding, alighting, and waiting for trains. “The only way to understand it was with a micro-simulation model,” he says. Arup very quickly recognised that the problem that had to be solved was to not impede train services; maintain a minimum level of service at key locations including platforms and key staircases, as well as safeguard the required fire and life safety egress levels, and that it could not be solved in 3D using currently (then) available tools. Arup set about writing the computer code to help analyse and solve the complicated 7-year staged construction sequence. Oasys MassMotion was born on the Fulton Center project. It is a 3D crowd analysis and pedestrian simulation tool that helps to inform design decisions about how a building can be made as safe and efficient for its occupants as possible. MassMotion is commercially available and supports modelling of both everyday movements as well as emergency evacuation and rare event scenarios. With this year’s launch of a free Viewer, slices of MassMotion’s highly-visual animations can easily be shared with stakeholders, communicating potentially complex issues and helping argue the engineering and design case for change. 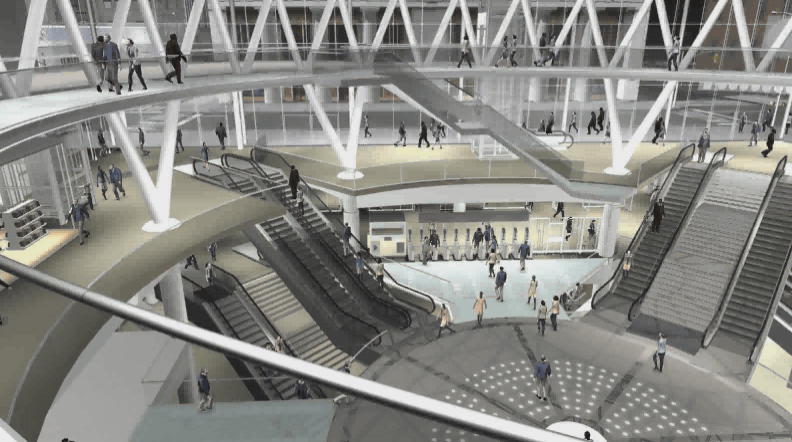 Work on the site included construction of the main transit centre building, rehabilitation of four existing stations, construction of an underground pedestrian concourse and connections to two other stations. Street-level access to the subway was also improved through new entrances in the historic 19th Century Corbin building, which was restored.